The room in which this book is being read is filled with radio waves bearing every kind of programme from all parts of the world. To become aware of what is present one must construct an efficient receiver, select adequately, and receive in an unadulterated form which is not complicated by alien oscillations. 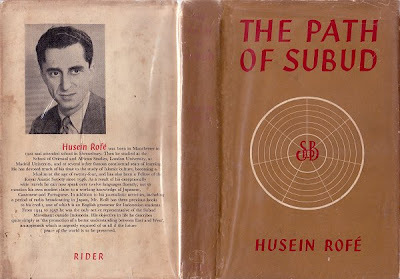 That quote from Husein Rofé's The Path of Subud dates from 1959 but provides food for thought in our age of mobile computing. Rofé was an early advocate of the Subud Movement, a tradition founded by the Indonesian teacher Muhammad Subuh Sumohadiwidjojo in the 1920s. Subud sprang from esoteric Islam - as did Sufism - but it also embraces elements of Buddhism and shares aspects of Gurdieff's 'Work'. Today Subud is a global ecunemical movement following the ancient tradition of seeking internal enlightenment - gnosis - as opposed to depending on externally imposed dogma. Recent experiments with fine tuning my personal receiver and selecting adequately have led me to the music of contemporary French composer Edith Canat de Chizy who first appeared here in my post about the fifteenth century alchemist and serial child abuser Gilles de Rais. Writing about the recording of Edith Canat de Chizy's music seen above - which includes her violin and cello concertos - a MusicWeb International reviewer wrote "This is one of the finest releases I have recently come across... such music of great beauty and of great communicative power came to me as a revelation... a wonderful release which I urge you to investigate" - an opinion which I can only endorse. Sufism teaches seeing with the 'eyes of the heart', and Edith Canat de Chizy - who to my knowledge she has no links with Sufism or Subud - has that rare ability to hear with the ears of the heart. Two works on the CD have overt spiritual connections - the title of Siloël for 12 solo strings refers to the Angel of Energy in the Hebraic tradition, while her violin concerto Exultet takes its title from the Latin text sung on Easter night in the Roman rite. In an interview in the CD booklet the composer talks of her music being "spiritually inspired", and in the MusicWeb review Hubert Culot describes how her music's often strong religious basis "may – to a certain extent – call Messiaen to mind". 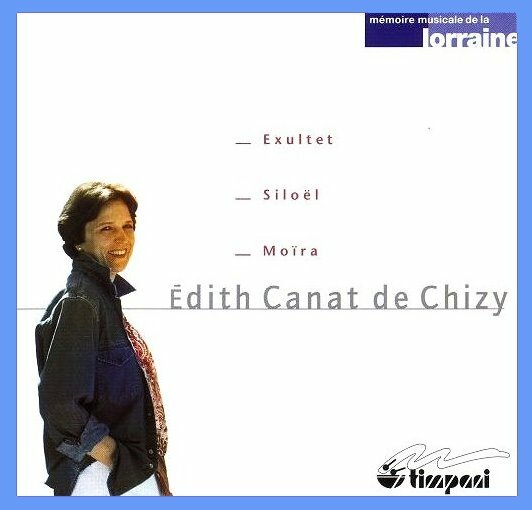 The final work on the disc is Edith Canat de Chizy's cello concerto Moïra played by Sonia Wieder-Atherton with the Philarmonie de Lorraine conducted by Pascal Rophé. Little more needs to be said other than quoting Hubert Culot opinion that "Moïra is, with Dutilleux’s Tout un monde lointain, one of the finest cello concertos of the late 20th Century, and an unquestioned masterpiece". This post got me so worked up with anticipation that I temporarily put aside streaming the McPhee discs and, holding my breath, went on a hunt for discs of Canat's works: four discs devoted to her compositions, including the disc at the heart of the post, and with no duplications. Also one work in an organ recital and one in a violin recital. A cornucopia! I have just listened to the disc featured and I really have nothing to say. The reason spiritual verbal works so often resort to metaphor is because what they write about is really ineffable. The ineffable is also central to the nature of music, and never more so than in Canat's case, I think. All I can say is that I was staggered, intensely moved, and I shall surely be returning to her works when I need them -- and I stress that word 'need'. May I just add that I'm well aware that only a mention of the word 'streaming' causes some people to move on or, on occasion, to write a diatribe. I understand why if the person is an obsessive audiophile, in which case there is mutual suspicion, for I sometimes wonder if such really give a damn about the music or performance at all. But even so, the vividness with which the music -- and in this case I think of the start of Canat's Siloel -- comes through my Altec-Lansing speakers can still give me a shock, and I've had them for seven years. It truly makes me wonder what the anti-streamers are looking for.